Holland Murray Fine Art specialises in 20th Century British art as well as work by selected contemporary artists. The work includes many established Modern British names with proven market records as well as carefully selected established contemporary artists working in the Modern British tradition and whom we believe to have future potential. 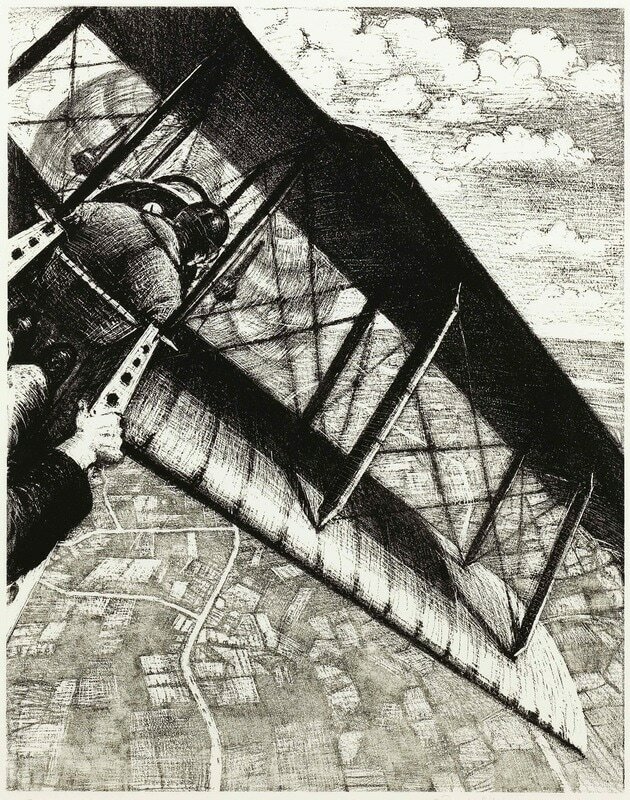 This is the fifth of Nevinson’s six prints, which show the process of building an aeroplane, from making parts, to assembly, and finally to flight. In this dramatically composed image, the artist expresses the fear and exhilaration of being a passenger in a fighter plane, with his hand shown gripping the side of the aircraft. He conveys a sense of movement by contrasting the strong diagonals of the wings and circular movements of the propeller with the patchwork of fields far below’. ​Reference: ‘Nash and Nevinson in War and Peace’, Leicester Galleries Catalogue, 1977, catalogue numbers 23-28.